As the temperatures outside plummet, it helps to be armed with a little advice on how to care for our mobile computer friends with Jack Frost nipping at all our heels! Laptops are designed to be run within an ambient temperature range which is usually between about 10 and 30 Degrees Centigrade. So when your laptop has been sitting in the car mid Winter all night and has got down to about 0-2 Degrees it is well out of it’s comfort zone. If you choose to operate your computer in these environments problems at this temperature can include issues lighting the screen backlight (the lights that allow us to view the monitor images on older laptops) and even the machine not powering up at all. 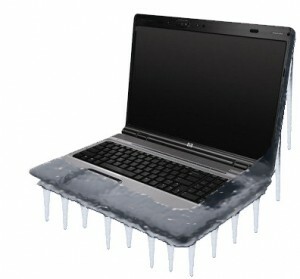 However, a bigger problem is when a very cold laptop is taken into a nice warm centerally heated house and turned on. The extreme temperature change can cause condensation to form and short circuit the interal components, sometimes causing irreversible dmamge!